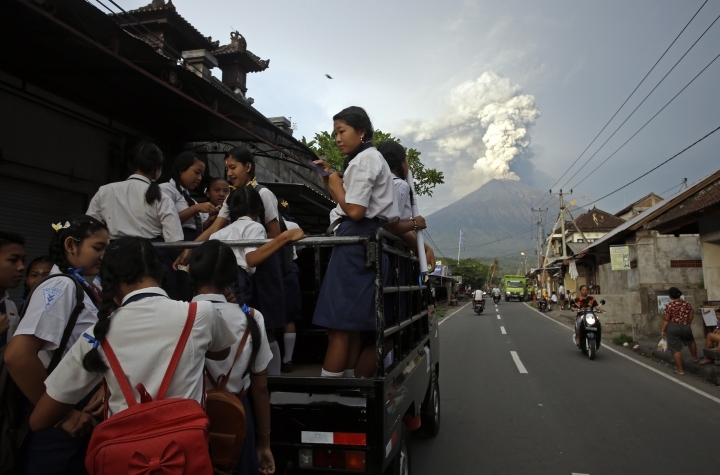 KARANGASEM, Indonesia — A volcano gushing towering columns of ash closed the airport on the Indonesian tourist island of Bali for a second day Tuesday, disrupting travel for tens of thousands, as authorities renewed their warnings for villagers to evacuate. 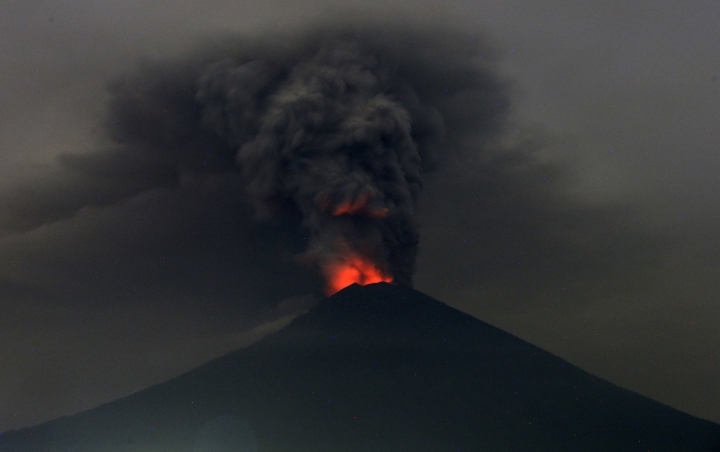 Mount Agung has been hurling clouds of white and dark gray ash about 3,000 meters (9,800 feet) above its cone since the weekend and lava is welling in the crater, sometimes reflected as an orange-red glow in the ash plumes. Its explosions can be heard about 12 kilometers (7 1/2 miles) away. The local airport authority said Tuesday that closure for another 24 hours was required for safety reasons. 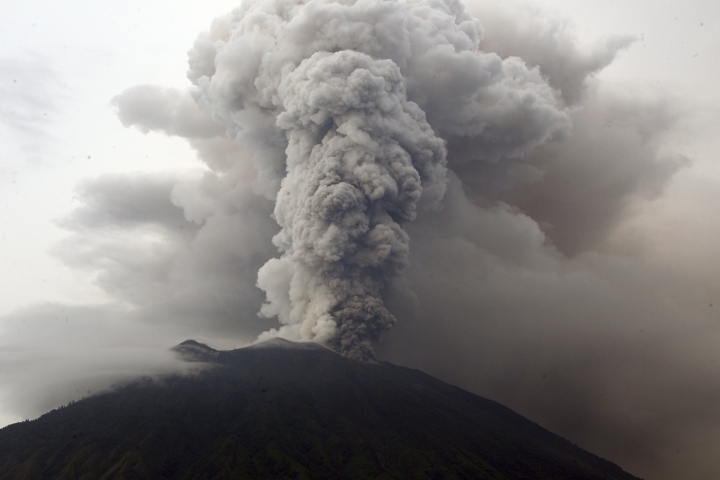 Volcanic ash poses a deadly threat to aircraft, and ash from Agung is moving south-southwest toward the airport. Ash has reached a height of about 30,000 feet as it drifts across the island. "I don't know, we can't change it," said stranded German tourist Gina Camp, sitting on a bench at the airport. "It's the nature and we have to wait until it's over." She decided to look on the bright side, saying she planned to go back outside to enjoy another day on the island. 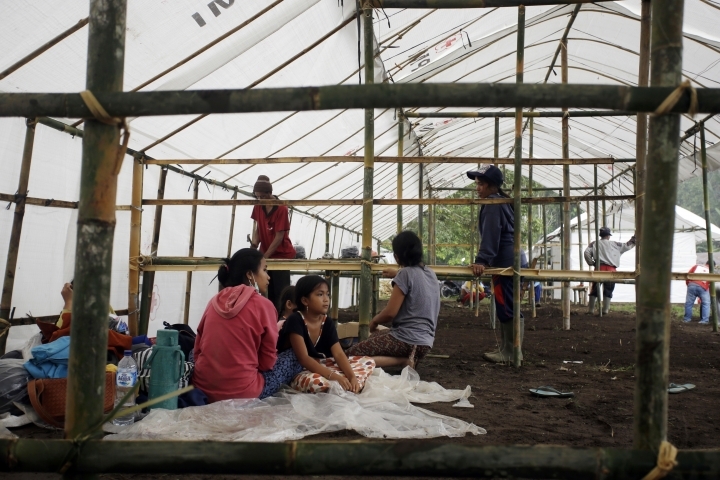 Indonesia's National Disaster Mitigation Agency raised the volcano's alert to the highest level Monday and expanded an exclusion zone to 10 kilometers (6 miles) from the crater in places from the previous 7 1/2 kilometers. 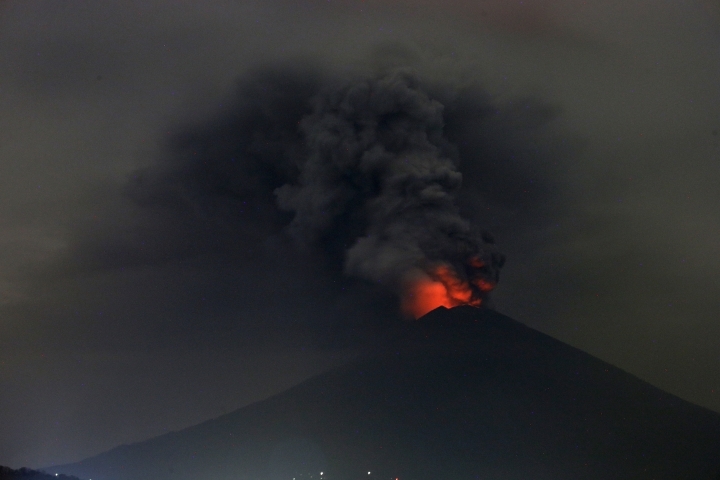 It said a larger eruption is possible, though a top government volcanologist has also said the volcano could continue for weeks at its current level of activity and not erupt explosively. 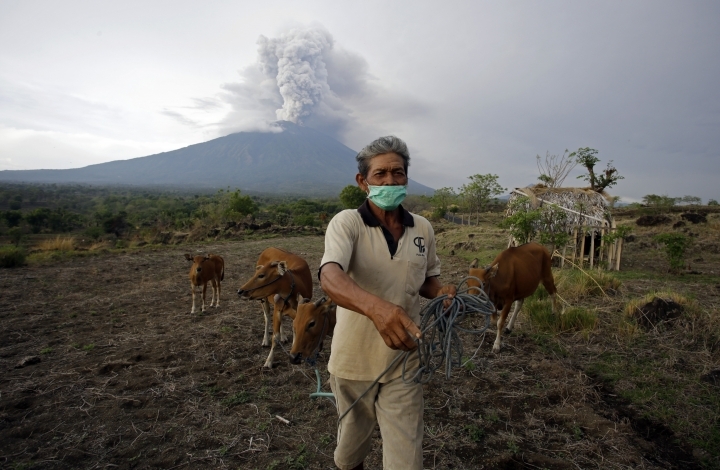 Agung's last major eruption in 1963 killed about 1,100 people. 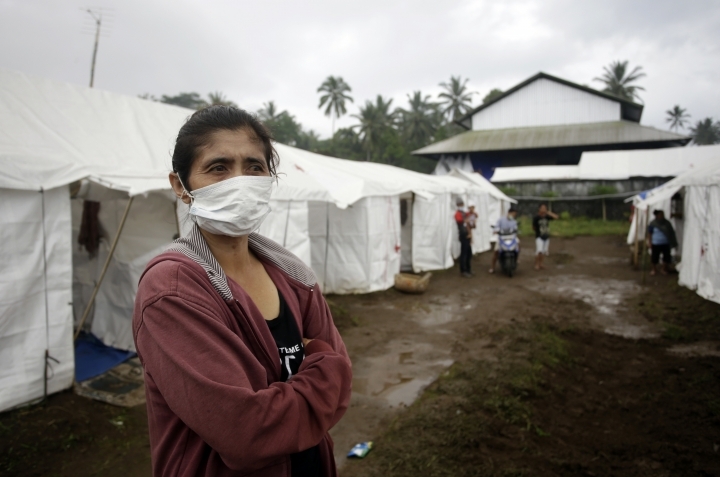 Authorities have told 100,000 people to leave homes that are in close proximity to the volcano, though as of Monday tens of thousands stayed because they felt safe or didn't want to abandon livestock. 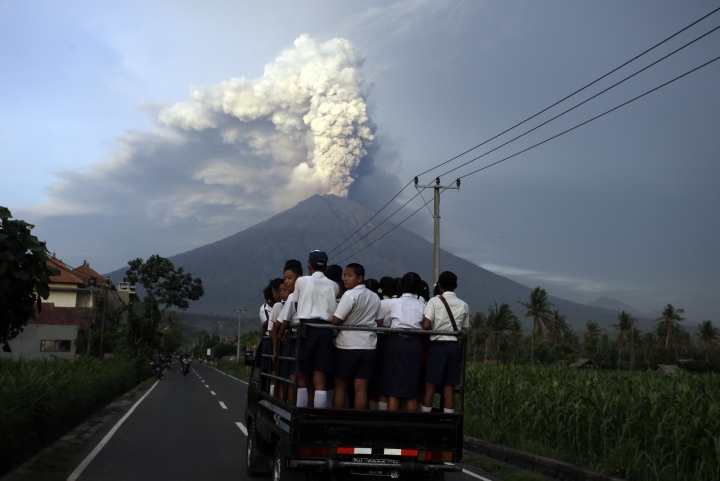 They have also warned people of the danger of mudflows from the volcano as it's now rainy season in Bali. The family had stayed at the same sports center in September and October when the volcano's activity was high but it didn't erupt then. They had returned to their village about a week ago. "If it has to erupt, let it erupt now rather than leaving us in uncertainty. I'll just accept it if our house is destroyed," she said. 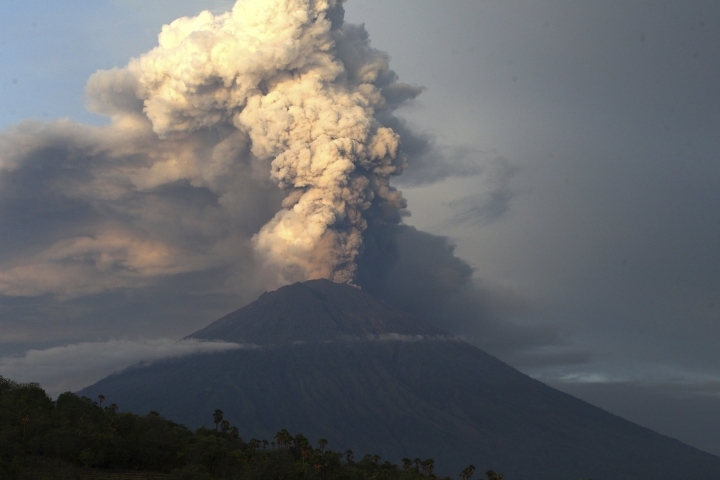 Volcanologist Erik Klemetti at Dennison University in Ohio said Agung's 1963 eruption was big enough to cool the earth slightly but it's unclear whether this time it will have a similar major eruption or simmer for a prolonged period. "A lot of what will happen depends on the magma underneath and what it is doing now," he said. 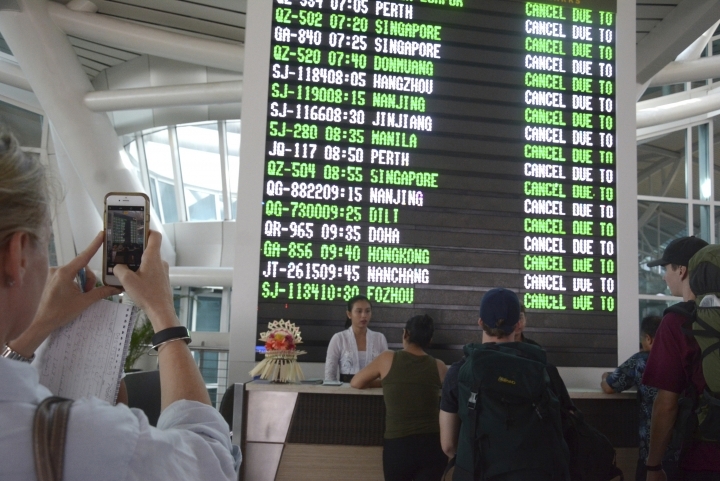 The closure of the airport has stranded tens of thousands of travelers, affecting tourists already on Bali and people who were ready to fly to the island from abroad or within Indonesia. Airport spokesman Ari Ahsanurrohim said more than 440 inward and outward flights were canceled Tuesday and about 59,500 travelers were affected, similar numbers to Monday. Bali is Indonesia's top tourist destination, with its Hindu culture, surf beaches and lush green interior attracting about 5 million visitors a year. A Chinese tour service, Shenzhen PT Lebali International, had about 20 groups totaling 500 to 600 travelers from the Chinese cities of Wuhan, Changsha and Guangzhou in Bali, according an executive, Liao Yuling, who was on the island. "They are mostly retirees or relatively high-end, so they don't say they are especially anxious to rush home," she said by telephone. If the airport stays closed, Liao said they would head by ferry and bus to Surabaya on Java where the company's charter flights could pick them up. "We are not really affected, because the volcano is too far away," said Liao. "We only can say we saw pictures of it on television." 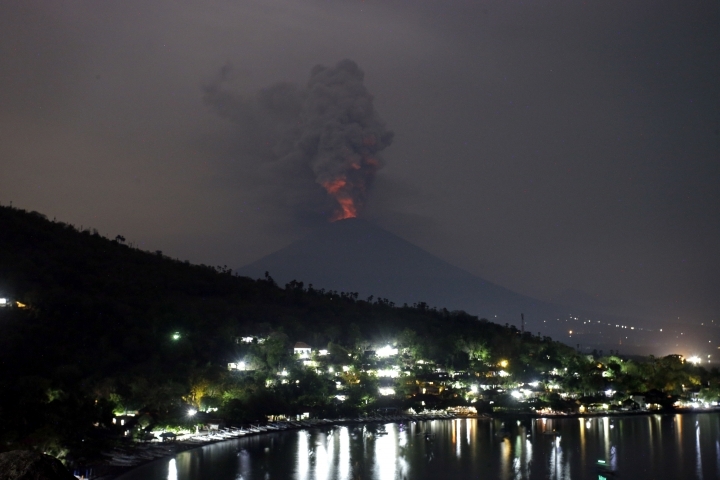 Indonesia's Directorate General of Land Transportation said 100 buses were deployed to Bali's international airport and to ferry terminals to help travelers stranded by the eruption. The agency's chief, Budi, said major ferry crossing points have been advised to prepare for a surge in passengers and vehicles. Stranded tourists could leave Bali by taking a ferry to Java and then traveling by land to the nearest airports. 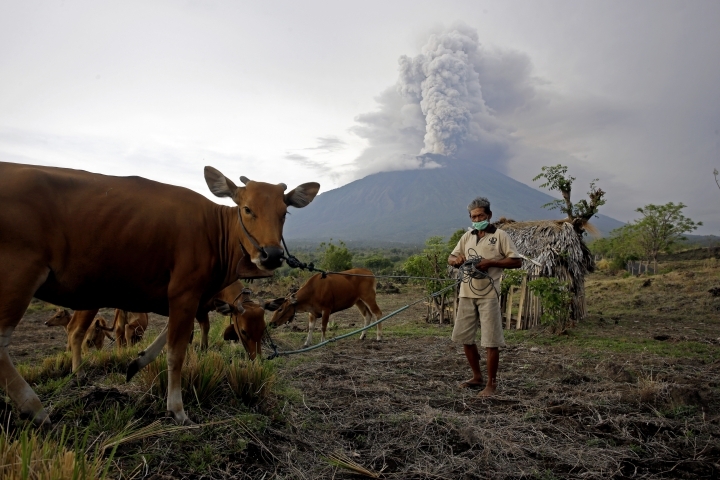 Ash has settled on villages and resorts around the volcano and disrupted daily life outside the immediate danger zone. "Ash that covered the trees and grass is very difficult for us because the cows cannot eat," said Made Kerta Kartika from Buana Giri village. "I have to move the cows from this village." Wright reported from Jakarta. Associated Press writers Ali Kotarumalos in Jakarta, Joe McDonald in Beijing and Seth Borenstein in Washington contributed to this report.